There’s nothing potentially more frustrating for a runner than the marathon taper…or any distance taper really. Last weekend I ran 21 miles for my last long run before starting my taper for the Walt Disney World Marathon weekend. This will be the 4th anniversary of my 1st marathon and my 8th marathon overall. I am elated to run and go for a PR at the place where I love to run the most surrounded by fellow runners, teammates, friends and family! So all there’s left to do is…taper. Tapering if you don’t know is a reduction in training time and intensity. For 16 weeks I’ve been pushing the envelope on speed and distance with the goal in mind of PRing at Disney. My current marathon PR is 5:15:07 and I have trained to come in under 5 hours for the marathon on January 12th. My secondary goal is a PR of any kind. With these goals in mind it is time to…train LESS? 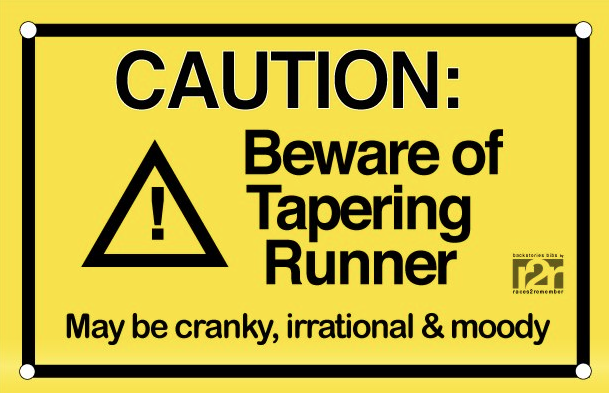 Yep, welcome to tapering…woo hoo. Great! Tapering…how’s that done? Train less, sleep more, eat less (since you don’t need the extra fuel for training), do more recovery activities like stretching, massage, foam rolling, go sit in the sauna, hangout and watch some Monday night football, etc., etc. Mind numbing I know as the energy starts to store up from all the training I’ve done sine summer. Still, it’s important. Science tells us it’s important so here’s how to do it! Good luck on race day!